It's absolutely amazing, I've bought it! Incredible level of control, absolutely miles ahead of what I was trying to do, thank you so much for this, the community was definitely in need of a detailed camera example! Thanks for all the threshold settings, perfect for tweaking to get spring lookaheads right! Also, is there a minor bug with the jump (not fall) overshoot buttons in the example? The positive (+) button never seems to be available to click? This is fantastic! I don't even have any need for a camera system at the moment, but I bought it to show my support. Thanks for releasing this! @elvisish: that's not a bad idea. 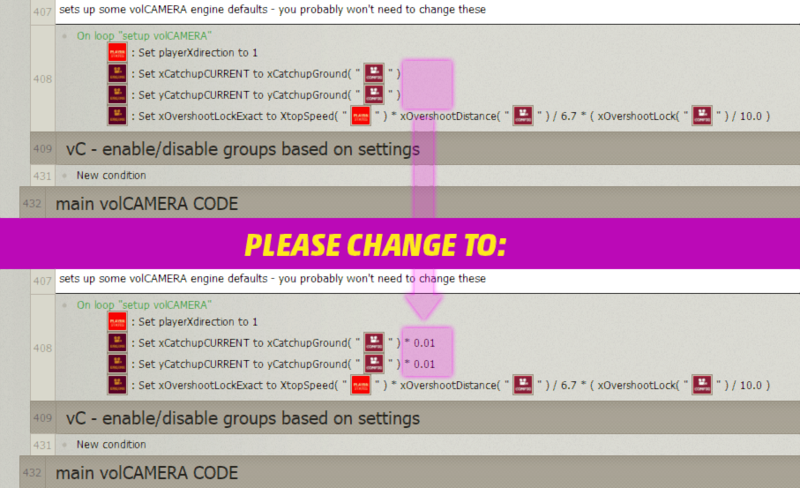 I think you can currently approximate something like that by using a low "speed" (XovershootSpeed) setting. But using a threshold setting like in those examples, for a pure 'deadzone' would be a good feature. I'll look into that. Until then, if you wanted, you could probably add it yourself, using something similar to what I've done with the "stairs threshold" feature. I'm getting this tonight after work! very well done - just watched your video and I'm highly impressed! Very nice.. Great job.. This is going into the Basket when I get home tonight. Damn, stuff like this makes me realize just how behind I am in FUSIONRY. Just saw this and picked it up, Vol. Looking forward to using it -- thanks for all your help. heh.. glad I got a reminder. Forgot about it, due to other issues.. I've noticed that I made a dumb mistake in the "connect volCAMERA with game" group. In the comments, I keep talking about the "ORANGE object", but the object in question is actually maroon (I changed the color towards the end of making volCAMERA, and forgot to update the comments). I'll update the Clickstore soon, but until then, just to clarify: when I talk about the "ORANGE object", I mean the volCAMdemoObject, which is maroon, with a vC on it. Haha. I wish! Irish accents are amazing.